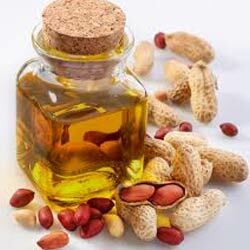 Arachis oil is commonly known as Peanut oil; sweet and flavorful edible oil. Arachis is a slow growing annual plant, scientifically known as Arachis hypogoa, belongs to Fabaceae family. It is originated in South America and commonly cultivated in India, China and the United State. Arachis tree is an annual herbaceous plant, well grown in sandy loam soil, best in sunlight and grows 30 to 50cm. Arachis oil is mild in flavor used for cooking oil in variety of Southeast Asian, African and South American dishes due to its high smoke point. Arachis Oil is extracted from kernels of peanut by pressing method. Its major component is oleic acid, linoleic acid & Palmitic acid and other components are stearic acid, arachidic acid, behenic acid and lignocerol acid. Arachis oil is sweet and flavorful peanut oil having deep yellow color with pleasant nutty aroma. Arachis oil is nicely blends with other essential oil, as it get absorbed to skin and deal carrier oil for others essential oils. It is used in massage oil as it energizes body and helps alleviate achy joint and muscle. It is used to moisturize to split ends and regenerates damaged hair. It helps to reduce protein loss so ultimately thickens hairs, strengthen hair. It is natural antiseptic as it prevents dandruff. It is used in preparation of lotions and creams, nappy rash creams. It is used in aromatherapy for massage body for relaxing ad rejuvenating. It is used as ingredient in preparation of earwax softens and skin medications. It is used to treat acne as it is used against dry skin and also protect skin from blackheads. It is used to make ointments and medication oils. It helps in lower blood glucose level. As it has anti oxidant, Vitamin E, helps in maintaining integrity of cell membrane of mucus membrane and protect it from free radicals. It is used to lowers high blood pressure, used to lower cholesterol as well, reduce risk of heart disease. It is used to decreases appetite as an aid to weight loss. It used to prevent cancer. It is used as solvent for intramuscular injection and in preparation of foods. Use peanut with caution as it contain allergens, not safe for everybody. It may cause vomiting, pain in abdomen, swollen lips and throat difficulty in breathing and chest ingestion. Avoid using while pregnancy or breast feeding.